Bank stocks could be in for another great year if the Federal Reserve's latest dot plot turns out to be accurate. It's all about the dots. Image source: iStock/Thinkstock. If you have any interest in bank stocks, then I have a chart you're going to want to see. It's called the dot plot. The dot plot is updated each time the Federal Reserve votes on whether to raise or lower interest rates. It plots where each member of the Federal Open Market Committee believes short-term interest rates, the fed funds rate specifically, will be over the next three years. FOMC participants' assessments of appropriate monetary policy: Midpoint of target range or target level for the federal funds rate. Image source: Federal Reserve. The thing to note isn't the fact that all of the dots are aligned for 2016. They're like that because the FOMC settled on a target fed funds rate of between 0.5% and 0.75% at its latest meeting. The more important point to take away from the Fed's dot plot is the fact that the people in charge of monetary policy expect interest rates to rise in the future. Take 2017 as an example. See how a plurality of FOMC members think the fed funds rate should end the year between 1.25% and 1.5%? Given where we are today, that'd equate to three more rate hikes of 25 basis points each. The story is similar if you look at 2018, which is expected to see even higher rates. A plurality of Fed governors think the appropriate range for the fed funds rate will be between 1.75% and 2% two years from now, with a majority forecasting even higher rates. This carries through to 2019, when rates are expected to move closer to most members' expectation for the long-term trend in rates, a fed funds rate around 3%. Why does this matter for banks? The Fed's dot plot is auspicious for bank stocks given that banks make more money when rates are high relative to when they're low. Since the financial crisis, rates have hovered near historic lows. The fed funds rate was essentially 0% until the Fed incrementally increased it by 25 basis points in December 2015 -- following that up with a second 25-basis-point boost in December 2016. 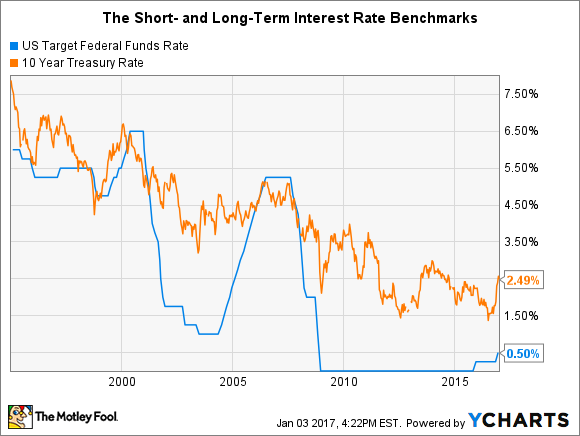 And long-term rates have also been low, with the yield on 10-year Treasury bonds dipping below 1.5% last year for only the second time since the end of World War II. It remains to be seen, of course, whether the Fed will actually follow through on these forecasts. After all, a lot can happen between now and 2019 that would throw these forecasts off. But if the Fed follows through with these forecasts, it would pad profits across the bank industry. U.S. Bancorp (NYSE:USB) is a case in point. If rates rise by another 25 basis points, U.S. Bancorp should earn around $200 million more a year in net interest income. For a bank that's already consistently one of the most profitable in the industry, the added income would allow U.S. Bancorp to continue raising its dividend and buying back stock. Things look even more optimistic for bigger banks. If the Fed's predictions for 2017 come to fruition, JPMorgan Chase (NYSE:JPM) should earn nearly $3 billion more in annual net interest income. This is revenue, not net income, but because it doesn't require any effort or investment on JPMorgan Chase's part, most of it would fall to the bottom line. The biggest winner of all would be Bank of America (NYSE:BAC). The North Carolina-based bank is the most asset sensitive of any big bank, meaning that its revenue and earnings are especially sensitive to changes in interest rates. If the fed funds rate does in fact end this year between 1.25% and 1.5%, then Bank of America's annual net interest income should grow by a minimum of $5.3 billion. It may go without saying, but this is one of the reasons that shares of Bank of America, JPMorgan Chase, and U.S. Bancorp all performed so well last year, and particularly in the fourth quarter following the Fed's rate hike in December. It's also one of the things that could propel them, as well as other bank stocks, to even higher ground this year.